Yes, I have a very large social media soap box, which I climb upon often to preach. One of the reasons I’m so passionate about talking about it is that it has many benefits that we reap daily. Also, unless you participate in it, it is difficult to understand why it is so powerful. Blogging is one activity that has clear benefits for a business, and we’ve outlined some of the most important ones below. Opportunity. Comprendia realized this benefit almost immediately after setting up our blog in June 2008. I was invited to blog for the Biotechnology Industry Organization (BIO) at the meeting soon afterward, and was also asked in 2009. From these great opportunities for exposure, to regularly receiving complimentary conference admittance, to having a good reason to talk to everyone from prospective clients to famous scientists, we’ve reaped many rewards from our blog. Website SEO (Search Engine Optimization). I recently talked to someone at a biotech company who was puzzled by the fact that content on their blog was ranked higher in web searches than their website pages. Why does this happen? Search engines love blogs and tend towards ranking their posts higher than other content. Now, while getting traffic to your website is only part of the equation, continually creating fresh content for your blog and monitoring what posts gain the most traffic help you to understand your customers better. Education. What’s new in your field, and what are your customers (and competitors) up to? Blogging is a great way to pull your head out of the daily grind and think about these topics, which are obviously very important for your business. We learn a lot not only in researching for our posts, but also in the feedback we receive after we post, and in participating in the blogging community for our field. Enjoyment. I’ll admit it, I’m addicted to blogging. It allows me to express myself, begin interesting discussions, and learn what is important to others. The scientist in me likes the possibility of analyzing the information, the marketer in me likes finding the ‘perfect’ image for each post. Am I part of a strange new ‘blogging breed?’ No, if you’ve been following this blog, you know that I’m a strong believer that we’ve been moving towards social media naturally for many years. 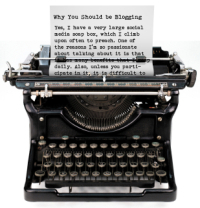 Some have postulated that traits that make people good bloggers are nothing new. In summary? Try it, you’ll not only like it, but you and your business will benefit from it. You may even be able to add a few items to this list. Also, software such as WordPress makes it easier than ever, check out our guide to get started. I just found this blog and I like it. I look forward to being a subscriber from now on. I also just began blogging myself and will look for tips here as to how I might improve. Thanks for providing the resource. Your customer’s blog is ranked higher because it’s not a static landing page. If your customers want to increase the rank of their homepages, they need to add more dynamic content there. Search engines love pages that change and visit them more. Pages that don’t change get fewer visits and usually worse search ranks.